Did you know there is a piece of Carian history, (or in this case lots of pieces) built with white marble, hidden in the mountains near Milas? It’s called Labraunda (or Labranda, depending on the source) and it is home to the Sanctuary of Zeus Labraundos. Sounds impressive, doesn’t it? Well, it is! This solitary and sacred place was visited on foot by Carian pilgrims to honor Zeus during sacrificial feasts. The unique remains of the halls that served as a venue are still here. At no other ancient site in Turkey will you find such dining facilities. Labraunda is an archaeological site worth visiting. As it happens with those hidden gems in Turkey, we were the only visitors there. The other people we’ve encountered were archaeologists at work. It is fascinating to see them at work in this environment. Sitting in the striking heat of the sun, carefully cleaning the marble bricks to bring out the white again and showing the Greek inscriptions that they are carrying. Collecting small pieces of ceramics in plastic boxes and making an inventory of it all. Recreating history and what must have been a majestic site. Yes, the metal roof they’ve put over a part of the excavations spoils the view a little. But we have experienced first hand what it feels like to be standing under the merciless sun for a few minutes, so we can fully relate to why circumstances turn this metal roof into a survival tool. The setting at Labraunda is overwhelming. It makes you feel humble and powerful at the same time: humble, for being surrounded by all this beauty, powerful when overlooking the site and the valley below. Zeus Labraundos on top of the world, or at least that part of it. The ancient site of Labraunda is quite stretched out and at 600 meters above sea level, offers impressive panoramic views. Today, the site is tranquil, and it is said this was also the case during daytime in ancient time. Only during the festivals that were held at Labraunda, the sacred grounds would welcome thousands of people waiting to offer their sacrifice at the altar and to talk to Zeus via oracular eels. (yes, that’s right!) You can read all about it in this article on the Turkish Archaeological News website. In case you might be wondering what you are looking at or where you are standing, there are informative signs all over Labraunda to help you understand the layout and history of the site. If you only have a few days in Turkey, your focus will probably be on visiting places like Istanbul, Cappadocia, Pamukkale, and Ephesus; which are an excellent pick and have become major tourist attractions because of their identity and preservation. If you have more time to spare in Turkey and you prefer off the beaten path destinations, then do make a detour to Labraunda. It can easily be combined with a visit to Miletus or Bafa Gölü where you can relax under the tree at Kapıkırı beach. Wandering around Labraunda will give you a taste of history in an extraordinary natural setting. As excavations are ongoing, you might even witness a new discovery or have a chat with one of the archaeologists at work who can explain the importance of the inscriptions on the marble. You’ll find some excellent and honest reviews on Labraunda on TripAdvisor. 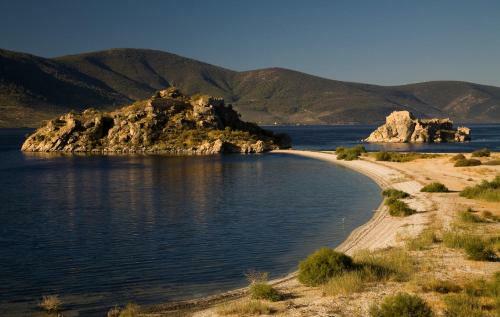 The nearest city is Milas, but if you are going to spend the night in the area, we’d suggest Lake Bafa where you have a good choice of pensions: Selene’s Pension, Agora Pension, or Pelikan Pension. The nearest airport is Bodrum Milas with regular connections to Istanbul airports. You’ll find cheap flight options here. Labraunda is a protected site, and there is a small access fee to be paid, check out the map search page or the location map below for directions to the site.